Anyone with a cat can tell you; the cat doesn’t belong to you, you belong to the cat! Not always affectionate, cats tend to be aloof until they are in the mood for love. 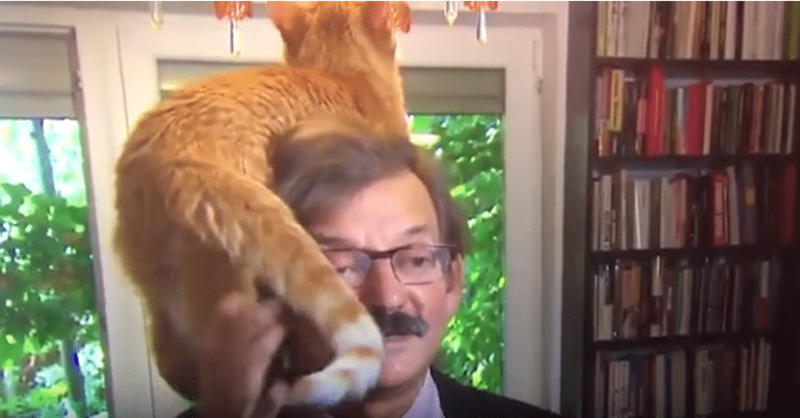 This is a feline fact that Polish scholar, Dr. Jerzy Targalski, is all too familiar with, and he knows his role! When a cat decides to grace you with their feline presence, you just be a good human and sit back and let it happen, no matter what you’re in the middle of doing. Such was the case during a very serious interview regarding Dutch current affairs with host Rudy Bouma, to air on NTR. 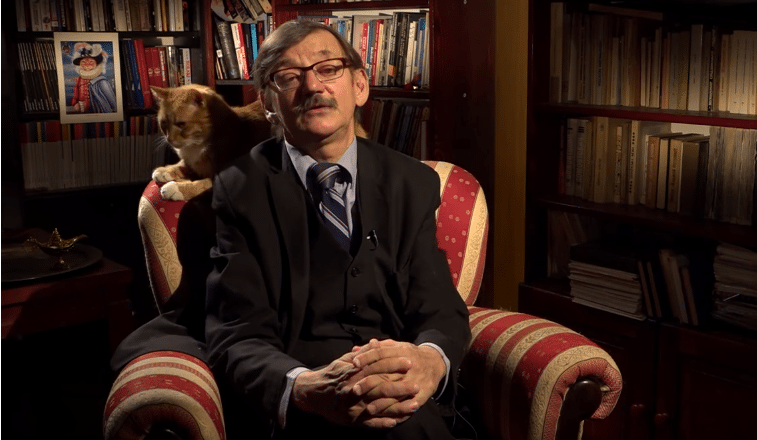 Dr. Targalski specializes in Polish history and political sciences and was being interviewed on the current political crisis facing Poland’s Supreme Court after deciding to lower the age of retirement for their judges. The new mandate would drop the age of retirement from 70-years-old to 65, effectively relieving nearly half of the judges from their positions. 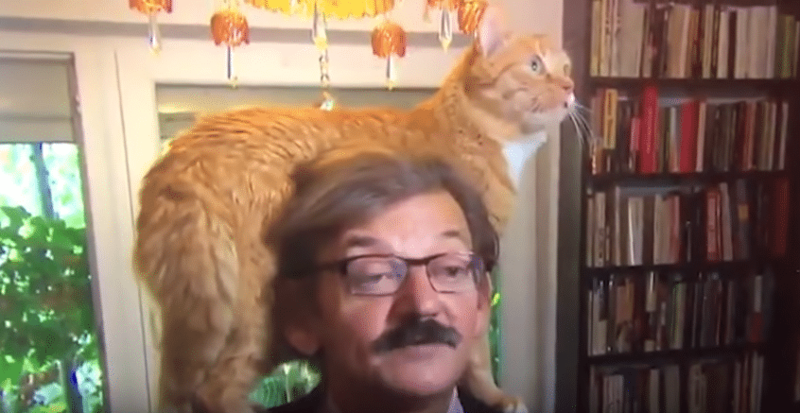 Targalski’s adorable Tabby/Calico cat, Lisio, had been lounging next to his revered human during the interview when he decided it was time for the good Dr. to redirect his focus. He stretched his way up Targalski’s shoulder while standing on the end table without his master even taking notice. After pawing at the preoccupied scholar, Lisio decided that he needed to get a little more proactive. 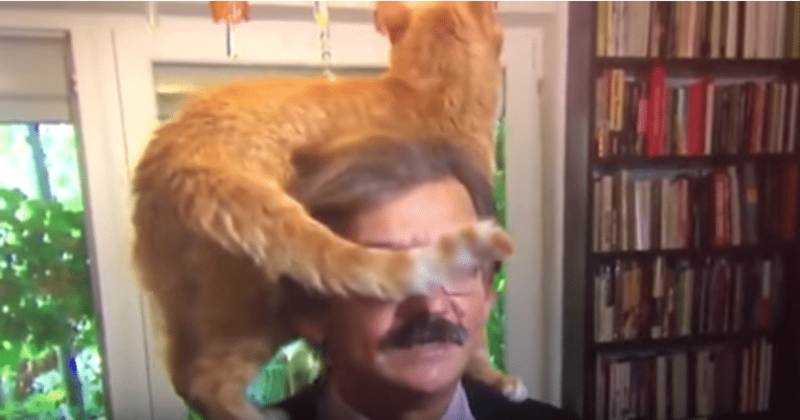 In the video, the singleminded fur-baby digs his little claws in as he gingerly swings from his human’s arm before steadying himself on Targalski’s shoulders. Still to no effect in, Lisio becomes even more determined to intercept his owner’s attention. After all, what on earth could possibly be more important than taking a timeout with your Kitty? For a brief moment, Lisio almost seems at a loss for his next move. Then he realizes how to get the attention he deserves. Almost as an apology for what he knows is going to come next, Lisio displays a quick show of affection as he rubs his face against his owner’s ear a few times. After loving on the Dr. still didn’t break his attention, the politically unencumbered cat is fed up! In a last-ditch effort to let his master know he’s had it with the talking, he whips his tail over the serious academic’s eyes in an almost mocking fashion! 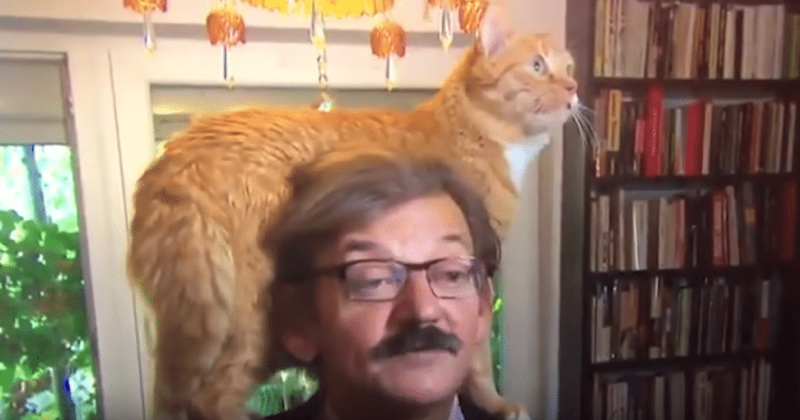 Now, you’d think that this renowned scholarly gentleman would at this point put the cat down so he could continue the conversation over the serious issue at hand, right? Not Dr. Targalski. Completely unburdened by his persistent furry friend, he simply grabs Lisio’s tail and holds it gently by his head. This comical display has the internet crying with laughter. Without missing a single beat, Targalski goes on to continue the complex conversation about his nation’s future, much to the dismay of his four-legged counter-part. One Tweeter claims that this hilarious clip can be taken as a stamp of great character. Any man so at ease with his cat, & his cat so affectionate toward him, has got to be an individual of the highest integrity, intelligence, & taste. Please send him to US where we are badly in need of these qualities. 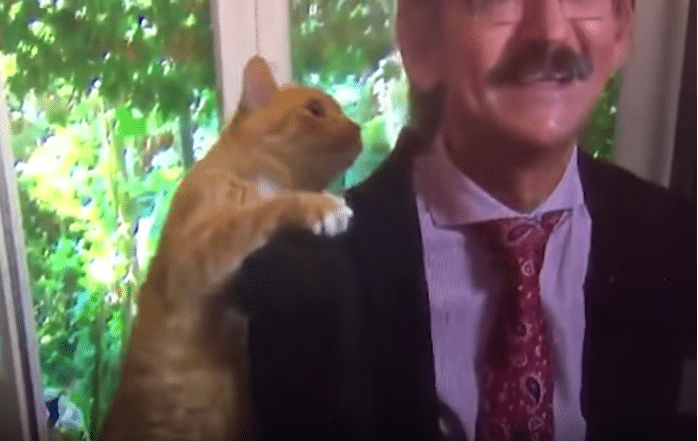 It’s clear when watching the video that Dr. Targalski’s resolve to carry on the conversation without shewing away his feline companion commands great respect, more so than he would get from his occupation alone.